Creative leftovers: Pressed Southwest Wraps. My girls don’t like them. Nope, not one bit. Except for my toddler, whom I often hear grunting and “eeeee” (please)-ing as I’m trying to enjoy my leftover curry (or this one!) or chicken tikka masala for lunch in peace. But who really wants to make a brand-new, from-scratch meal (that their kids are probably going to whine and complain about anyway) every single night? Always make extra. Extra rice, extra cooked and chopped chicken. And keep it in the fridge to use in a different recipe. Always make extra (again). Extra enchilada sauce or enchiladas, extra filling for these wraps. And freeze it for another meal. When I need a small amount of something, like tomato paste or green onions, I portion out the rest and freeze it. These wraps do a great job of combining these odds and ends into something low-effort and really delicious. The best part is that you can add in whatever you and your family wants. I subbed in corn for the original recipe’s peppers and adjusted the spices a little bit so that my girls will enjoy it without complaining. With the right tortillas and brown rice you can make this gluten-free and/or clean. Unfortunately, I don’t know if there’s a way to successfully make this dairy-free because the cheese and sour cream help hold the wrap together, but you could try it with vegan cheese and just really sticky rice. Let me know how it works! Combine the rice, onions, spices, and lime juice in a medium bowl. Stir in chicken, beans, and corn. Dollop a spoonful of sour cream around the center of an open tortilla and sprinkle with cheese. Spoon a couple tablespoonfuls of the filling onto the tortilla, then roll like a burrito. Spray the cooking spray on the seam side and lay seam-side down on a plate. When all wraps are assembled, heat a nonstick griddle on medium to medium-high heat. Carefully lay a couple wraps at a time on the griddle, seam side down, and press down all over with a spatula. The cooking spray helps seal the seam shut. When browned, flip, press again, and remove to a warm plate until all wraps are finished. You can wrap each individually in foil to save and reheat in the oven later. I’ve been MIA for awhile… We’re preparing for Baby Girl to get here in less than 2 weeks, & my energy level hasn’t exactly kept up with the to-do list. I adapted the recipe from the Our Best Bites that have been all over Pinterest. Theirs uses green salsa & green onions; not having either of those on hand, I made mine “red” taquitos. (Or rather, since they’re creamy, maybe they’re “pink” taquitos.) I also decreased the spice factor a little, since The Munchkin seems to not sleep well after consuming moderate amounts of chili powder. Weird? Yes. Could just be correlation rather than causation, but it’s true. The cracked ones on the left are the corn. So now I just use flour. Preheat oven to 425 & line a baking sheet with parchment. In a large bowl, combine first 6 ingredients until well incorporated. Then mix in the cilantro & onions. Add chicken & cheese & mix thoroughly. Heat a few tortillas at a time between 2 paper towels in the microwave for 20-30 seconds or so. Then spoon a couple Tbsp. 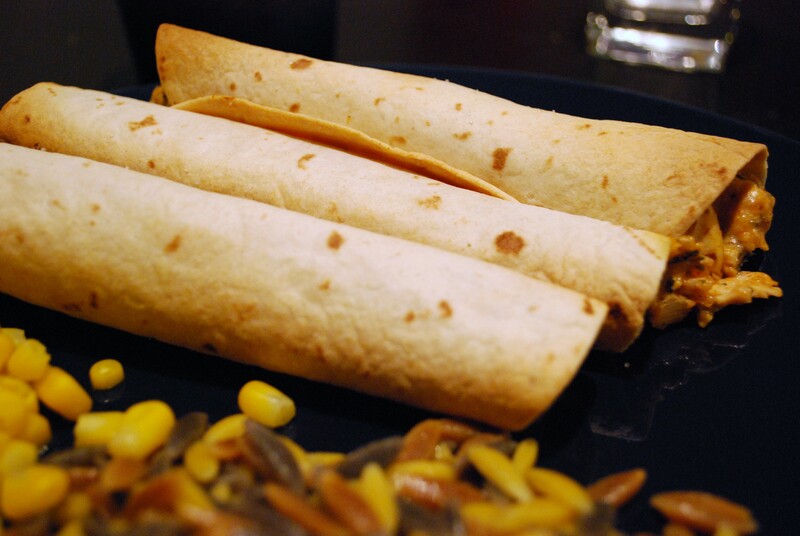 of the chicken mixture onto the bottom third of a tortilla & roll it as tightly as possible. Place, seam-side-down, on the cookie sheet. Repeat with remaining chicken mixture & tortillas, then spray with cooking spray & sprinkle with salt. If you want to freeze them, place them in a single layer on a greased baking sheet & freeze for a half hour or so, then place in a labeled Ziploc bag for up to 3 months & bake at 425 for 20 minutes. 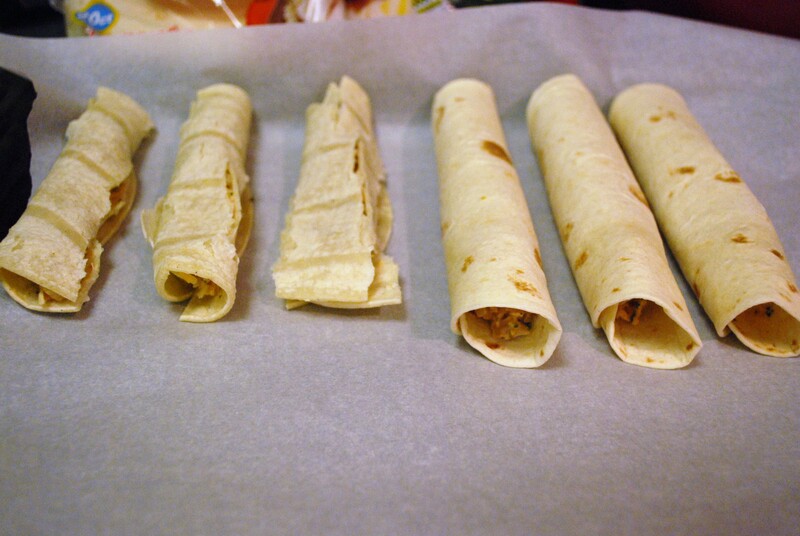 If you have leftovers, freeze any baked taquitos & microwave on high for a minute to a minute & 10 seconds. They won’t be crispy, but still delicious. Now, I will likely be MIA for a little while longer until I get used to being a mommy of 2 Munchkins. Until then!